Evolving Logo is a generative system using the principles of evolution to adapt and enhance a company’s logo according to its current state. This state does not inflict on the logo directly rather than providing an abstract habitat in which the population evolves. Different variations of the logo reproduce while their genes randomly mutate and recombine – the population lives in constant change and only the fitest stay to reproduce. The fitness is defined in two ways. First the computer compares attributes of each individual with corresponding company-parameters that reflect its current state. And secondly the employees of the company choose their favorite logo occasionally. The results combined are translated into a ranking. The high-score individual represents the company. The individuals themselves are represented using a mathematical simulation of life showing emerging behavior: the Cellular Automaton. Its setup and behavior can be mutated, recombined, passed on to children and analyzed by the system. As a result the logo reinvents itself over and over and really reflects the current state of its owner. In order to test the thesis, “Evolving Logo” was put into practice for the Max Planck Institute of Molecular Cell Biology and Genetics Dresden, which studies how cells form tissue. However, the concept of the could have been used for any other company. Published in Generative Gestaltung, Dynamic Identities and several magazines. 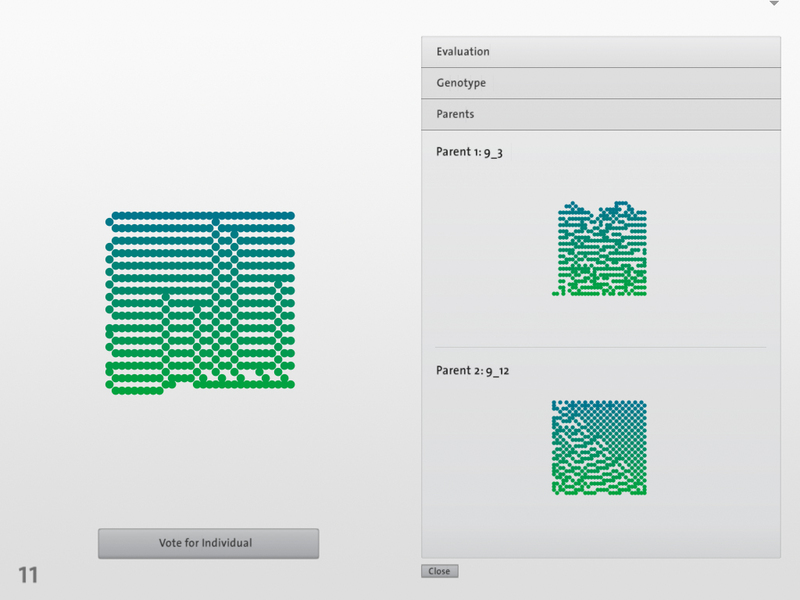 See also: genoTyp – An Experiment about genetic typography.